If you visit a lake or pool in Switzerland in the summer, you can typically see a stash of Zweifel potato chips poking out of every family's beach bag. Along with Migros' Kult Ice Tea, the chips have powered generations of sunny day revelers. Of course they are not merely for the summer, but any decent Swiss Apéro also keeps a steady supply. Zweifel chips are, in fact, one of Switzerland's most beloved snacks. They are produced entirely in Switzerland from Swiss potatoes—you can even see each individual farmer on this interactive map on the company's website. The company has been producing chips in Switzerland since 1950. Over the years they have expanded into other flavours and varieties of chips, and other realms of snack food, but it's the plain and paprika flavoured potato chips that dominate the market. In 2012 alone, the company had sales of over 210 million Swiss francs with nearly six and a half thousand tonnes of potato chips sold throughout the country. They are crispy, but not too greasy. The popular paprika flavour has a mild, slightly smoky and sweet taste, which actually makes an excellent coating for chicken. Now, I'm often too lazy to make anything like fried chicken, but if I'm craving something in that vein, this potato chip crusted chicken does the trick. It is absurdly easy to put together, just dip your drumsticks in a yogurt/mustard/mayo dressing then roll in the chips. The result is a glistening and crispy drumstick. Mix together the yogurt, mayonnaise, mustard, and pepper in a shallow dish. Reserve a couple of handfuls of chips for snacking, then use smash the remaining chips while they are still in the bag. Put these in a second shallow bowl. 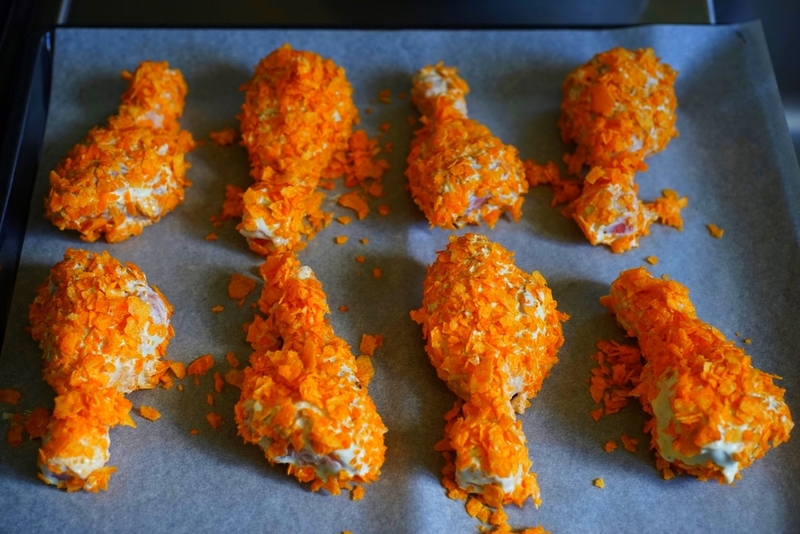 One at a time, dip the drumsticks in the yogurt, then coat with chips. Place on the parchment lined baking sheet, then bake in the oven for about 35 to 40 minutes, until the outside is crispy and the juices run clear. This would also work well with other flavours of potato chips. You could also use chicken thighs instead of drumsticks, or a mix of both. 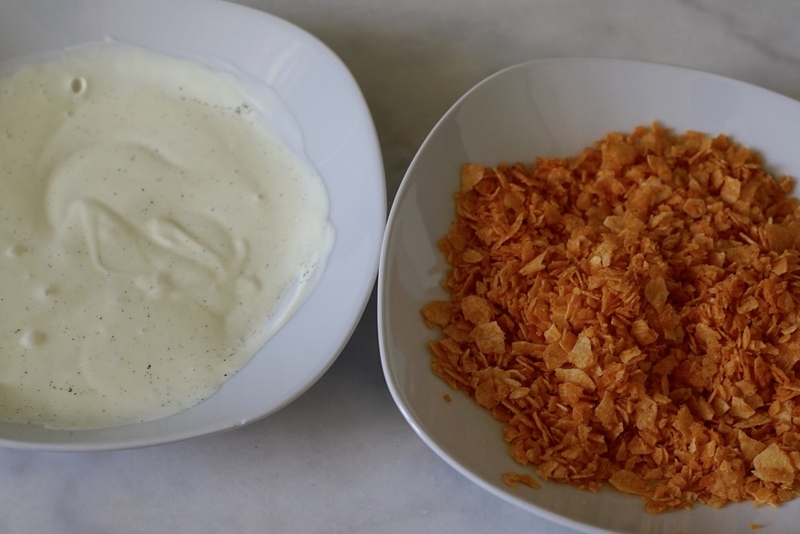 If you are feeling adventurous, you could experiment with other spices in the yogurt, especially if you are using a plain chip.